Connor Tekyl hit an RBI triple for the Pearl in Fridays 6-3 victory over the LA Brewers in the opening round of the CCL playoffs. Most players sweat when the heat is turned up a little bit. Put a couple men in scoring position and the hands get a little clammy. Add the pressure of the playoffs and they’re libel to build up kidney stones. But when you are a couple of cool clams like Andre Gregory and Andrew Boes, you just make Pearls, Neptune Beach Pearls. 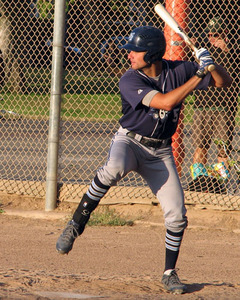 The timely hitting of Gregory and Boes’ ability to get out of several early jams, enabled the underdog Neptune Beach Pearl to defeat the top-seeded LA Brewers 6-3 in the opening round of the California Collegiate League playoffs Friday. The Brewers were the top hitting team in the CCL this season, posting a .322 average and .443 slugging percentage – both more than 25 points beyond the nearest competitor. But neither the impressive stats nor the Brewers 30-7 record phased Boes, who went the distance, allowing 6 hits 2 walks and 3 earned runs, while striking out 13. Constantly having the tying run on base or on deck didn’t shake Boes either. The Pearl (28-23) staked Boes to a 3-0 lead in the second on an RBI single by Gregory. He drove in Marcus Vidales, who led off the inning with a single. They collected the Pearl’s only two hits in the inning, but two wild pitches and two errors enabled the Pearl to score two more runs. By contrast, the Pearl played near percent defense committing no errors and a passed ball was their only blemish. But that didn’t mean Boes didn’t have obstacles to overcome. The Brewers rallied right back with two runs in the bottom of the second, scoring both on a single that bounced over first baseman Eric Sapp. The Pearl had the bases loaded and nobody out in the fourth and two on with one out in the sixth, but failed to get a run home with the heart of their order at the plate each time. Instead it would come down to Mr. Clutch, Andre Gregory. After Vidales (4-for-5) singled and stole second in the seventh, it looked like the Pearl might waste another opportunity to give Boes a little breathing room, but Gregory legged out a two-out infield single up the middle. LA shortstop Dylan Moore dove behind second base to snare Gregory’s sharp grounder, but was unable to get up and throw out Gregory in time, allowing Vidales to make the lead 4-2. The Pearl gave Boes a little more buffer room in the ninth behind a single by Ozzy Braff and an RBI triple into the right field corner by Connor Tekyl. Tekyl then scored on Vidales’ RBI single to center to make the lead 6-2 with Boes needing three more outs for the complete-game victory. Boes would make Cummings sweat just as little more in the ninth when the Brewers picked up a run on a single and two-out, RBI triple by Jon Torres. Boes responded by striking out pinch hitter Nick Anderson to end the game. The Pearl advanced to Saturday’s afternoon game against San Luis Obispo (41-12), an 8-1 victory over Walnut Creek (22-26) on Friday. The winner of the Pearl-Blues game will advance to Sunday’s championship round where a victory will would end the tournament. If the lone 2-0 team were to lose Sunday’s first game to the team that survives the losers’ bracket, that same team would have to come right back and beat the victor in winners’ bracket again. Cummings said the Pearl will need to continue to play the kind of clean baseball they played Friday, if they want to win the championship. The Pearl have made championship Sunday twice in the program’s four season, but has yet to claim a championship. Gregory thinks this group can do it.